Apple devices use the 'Appstore', Android or Google devices use the 'Playstore'. Using your phone or tablet go to these Stores, search 'ProofSafe' and download the App. It's important that you 'Allow' the various permissions so that ProofSafe can operate on your device. Once you submit this 'New Registration' you will receive a confirmation email confirming your login details. Login to the App and press the black arrow to download the forms to your device. 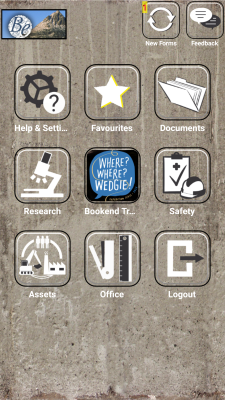 First use of the App needs to be within range of WiFi or 3G/4G data for verification and downloading forms. First step is to simply spend 5 minutes having a play around, you can't break your account or destroy your settings so just have a go. This is not like the old .DOS system where one false move was critical! Try the various icons such as the 'duplicate' button this is one of many that can save you a lot of time especially on repetitive jobs. Ensure you also look at the menu options on the various pages. 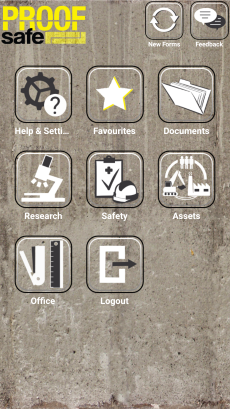 The standard home page shows a range of folders for sorting different types of forms such as Research forms or Safety forms, there is a folder for Documents and any other you may need, these folders can be customised to suit your needs and branded to your organsiation as per the images. Additionally if you go into the Favourites screen and press the menu you're able to set it as your home screen, then just nominate your most used forms as favourites by pressing the stars. We are currently updating our Form Builder to a shiny new 'drag and drop' interface, in the meantime we are assembling and editing forms on your behalf, simply send us the details of what you want and we'll compile your form, then work closely with you to fine tune and edit as needed. Once you upload a file your data will be emailed to the email address nominated in your account settings. This data arrives in a spreadsheet and is easily transferred to most other formats. If you want your data to go somewhere else or arrive in a different format just let us know and we'll help you set it up. ProofSafe will hold documents for you, they might be instructions, field guides or SWMS's or Operating Procedures. How to open documents: A document can be attached to any form so it's immediately available form that form, tap the link, however they are all available in the 'Documents' folder. Touch the black arrow to download, touch the document file name to open it. Sometimes you may be given a range of options regarding how to open the file, select one of the options such as 'Open in iBooks' or 'Copy to iBooks'. You need to allow ProofSafe to access your camera and images, your location, telephone, modify SD card, network access and 'read device state and identity'. This should happen during setup however if you have a problem such as: 'Can't access camera' or 'Camera has stopped' then first step is to check in your device settings that you have allowed ProofSafe to use the camera and the various permissions are set. ProofSafe works Offline so you can collect data anywhere, however we integrate with Google Maps which requires data transfer to show you the mapping images. This means if you are working in a remote location you need to 'cache' (save it to your phone/tablet) the maps to your phone before your trip. Before going to a remote area you should cache the map you want, that map will then be visible within ProofSafe when your out on location. In the search bar type "ok maps"
Google may ask for details of your Google account to allow you to get Maps or other Google products, this is nothing to do with ProofSafe. Zoom to your desired location - find the area you are going to be working in and zoom right down, use satellite view to get that image layer. Up the top there is a search bar, type in "ok maps"
Click 'Search' (magnifying glass) - make sure the area selected includes everything you need, if not you may need to move your map a bit or, after completion, repeat the process for the next area. Please note that at this point it will just show you a relatively large area, it won't be zoomed in, this is ok, it's just showing you the total area even though it has actually saved a more detailed image / map on your device than you can see here. 1. Google maps which you might have used to navigate, zoom and search. 3. ProofSafe - Uses the map now saved on your device to show your location. 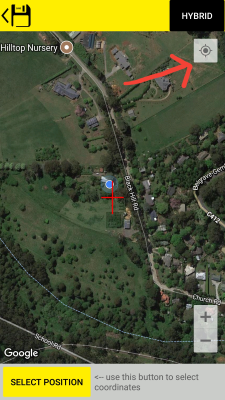 You can zoom, scan and search within ProofSafe and Google Maps but you can't zoom within the Caching function - this will just show you an outline of the entire area you have saved. Small tip - When you're in ProofSafe you will see a 'target' icon in a white square; top right hand corner, (see image) press this and the map will centre on your current location. The blue dot gives you an indication of how accurate your GPS currently is, if the the blue shadow around the dot is large then accuracy is not good. Press the yellow 'SELECT POSITION' button (bottom left) to lock in and save your desired coordinates. 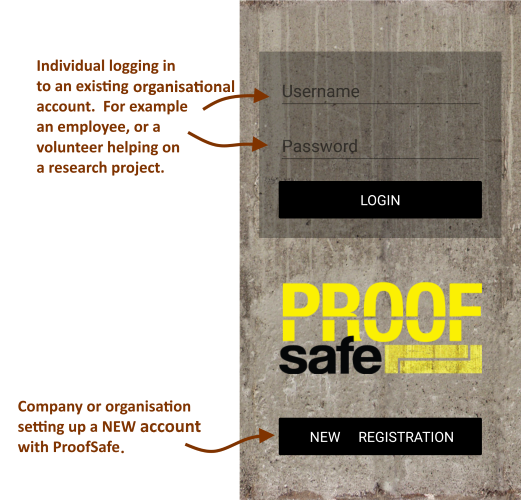 Call, email or use the feedback button on the ProofSafe App to contact us, we'll respond quickly and will include further information here when requested.